Assembly is trickier than it looks. 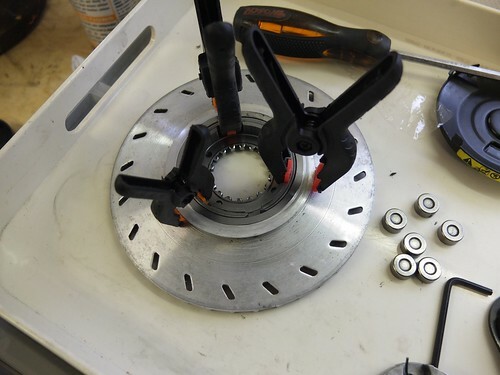 The spring to move the shoes away from the drum fits into a groove on the outer perimeter of the brake shoes, which means that they spring out when you take the pressure off. Then the spring drops out of the groove, so you have to start again. I retained the shoes as seen. I then made a spiral spring out off an old spoke to hold the shoes in place while the bearing race was dropped in. The spring was then screwed out from the bottom of the unit and the race put fully home. Assembly after that is straightforward, just a bit finicky. A simple and robust mechanism.